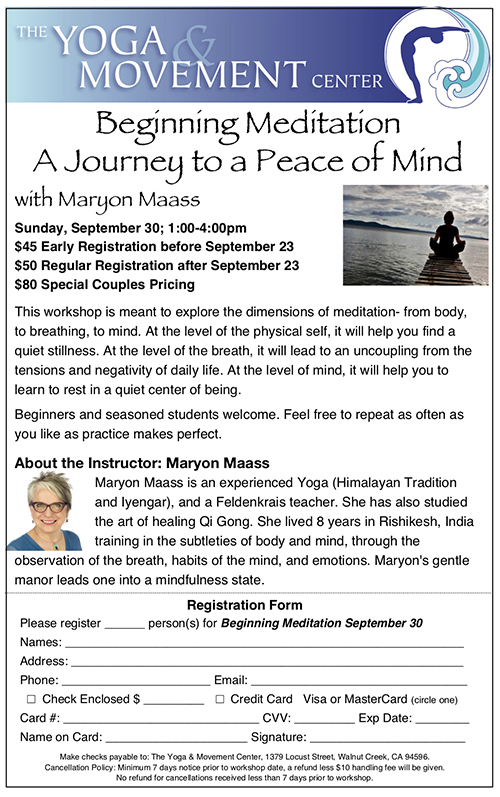 Come, learn, and mingle with friends and new members alike while practicing easy Yoga breathing to improve flexibility and strength of body and mind with Maryon Maass. Learning to relax consciously is a skill. Practice, and feel the peace within. This benefits the nervous system thus eliminates stress in the body and mind. Yoga Nidra, or yogic sleep as it is commonly known, is an immensely powerful meditation technique, and one of the easiest yoga practices to develop and maintain. While the practitioner rests comfortably in shavasana (corpse pose), this systematic meditation takes you through the pancha maya kosha (five layers of self), leaving you with a sense of wholeness. Included are gentle movements for rejuvenation. All levels welcome. Silence is the deepest and most authentic form of communication, both with others and within ourselves. It is the language that transcends the constant noise in our minds and allows us to experience our essence, our true Self, that purest state of being, a state of peace, joy, and love. Silence is not merely an absence of speech. It is a fullness of the mind; the mind filled with the flow of an energy stream rising from within. For such a silence one needs guidance. A guided silence helps the participant channel their emotional energies, directing them inward to the healing source of life force. The silence retreat guide takes care of the personality issues that arise in the participants through techniques of the ancient wisdom of the Himalayan Tradition. San Damiano Retreat Center is located on a secluded property with beautifully forested hills and views of Mount Diablo. Its serene setting and high vibration lead the mind body effortlessly to stillness. Private Sessions for Restorative Yoga & Feldenkrais – general healing consultations.